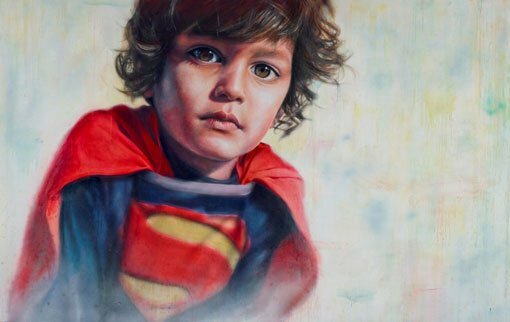 Melbourne artist Vincent Fantauzzo has won the 2014 Archibald People’s Choice award with a self-portrait as his four-year-old son. His painting All that’s good in me (self-portrait as son Luca) received the most votes of the 54 finalists. It is his second consecutive People’s Choice win and makes him the most awarded artist in the 26-year history of the category, with a total of four People’s Choice wins. Fantauzzo has been an Archibald Prize finalist six times. Vincent’s Archibald Prize entries in the past few years have been a window into his life, said Art Gallery of New South Wales director, Dr Michael Brand. Last year Vincent painted his partner, actor Asher Keddie, and won the People’s Choice prize, and this year he has won the prize again with a self-portrait, portraying him as his son, Luca. Describing his 2014 Archibald Prize entry, Fantauzzo says: l loved painting this portrait. [Luca and I] worked on it together and it is now a memory we can share forever. Children are so confident as artists and with their opinions. I hope he never loses that. I find the look in Luca’s eye to be so innocent yet there is a strength and a vulnerability there too. Fantauzzo’s earlier People’s Choice awards were for his paintings of actors Heath Ledger in 2008 and Brandon Walters in 2009. His portrait of Ledger was highly commended by the Archibald Prize judges. In 2011 Fantauzzo also won the Packing Room Prize with a portrait of his close friend, chef and restaurateur Matt Moran. Moran is Luca’s godfather and also heads up the catering company MorSul, which was appointed as the Gallery’s restaurant, cafe and event food partner in May. Vincent Fantauzzo receives $2500 and a $1000 ANZ Visa Gift Card. This year, 16,359 visitors to the exhibition voted in the People’s Choice award. Each year one voter of the Archibald painting that receives the most votes is selected at random to win a prize. In 2014, the lucky voter is Kate Day, who receives $2500, a $1000 ANZ Visa Gift Card and one night’s accommodation at the Sofitel Sydney Wentworth. Today the Gallery also announced the four winners of the 2014 Young Archie competition. In its second year, the Young Archie competition invites young artists between the ages of 5 and 18 to paint a portrait of someone who is special to them. This year, there was a huge response with 1015 entries from every state and territory in Australia. On behalf of ANZ I congratulate Vincent Fantauzzo on winning the Archibald People’s Choice award. It’s a worthy winner and I hope many more people are able to enjoy the artist’s work and the rest of the Archibald finalists as they make their way around regional Australia, said David Gonski, Chairman, ANZ.